The Bay Area’s median household income is $153,057—which, after taxes, is five times more than the earnings of those families living below the poverty line ( $24,300 ). To raise awareness of this pay gap, we partnered with the Tipping Point to simulate the struggle. The campaign was designed to look like a traditional retail promotion. We were proud to receive a wood D&AD pencil, bronze One Show pencils, and a gold ADC cube among other awards for this campaign. In order to get the right look for retail, we worked with local sign painter Jeff Canham to create original art for all the posters. The result looked like it could be part of a traditional sale promotion in a grocery store. 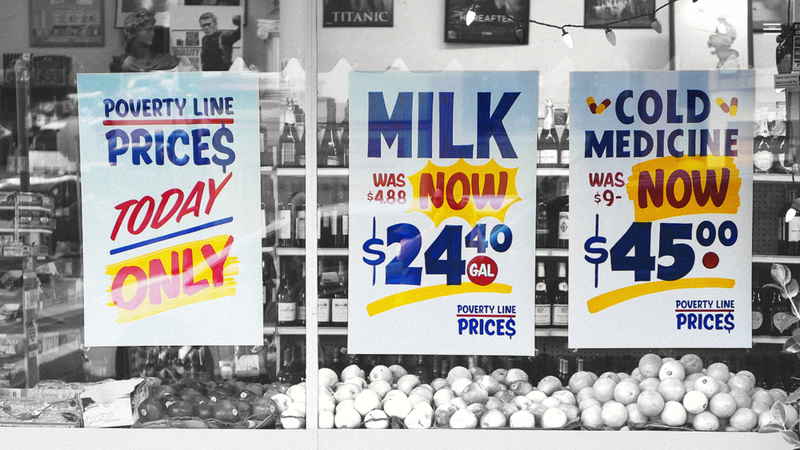 The campaign was introduced with a provocative film, we placed undercover cameras in a high-end San Francisco (Nob Hill) grocery store and filmed people’s reactions as they were charged prices five times higher than the real cost, highlighting what it would feel like to be shopping there for those on the poverty line.